It’s nice enough to reside in one of Money Magazine’s “Top Places to Live,” but now that you found your dream car, life just got even better. 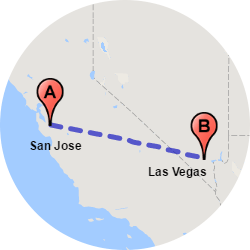 The only problem is – your new car is coming from somewhere outside Southern California, so now you have to find reliable car shipping in Irvine. At Easy Car Shipping, we’ve successfully transported vehicles of all kinds – from sport cars to sedans to classic and exotic car transport – safely and securely. Are you a car dealership, like Irvine BMW or AutoNation? Our vehicle sales clients return again and again for luxury car transport to their customers. We’ve shipped Porsches, Bentleys and high-end Audis, to name just a few. If you’ve got a job transfer and you want to send your vehicle ahead, or Katie needs her car at college, we can get it there for you. How much does it cost to ship a car to or from Irvine? You’re already spending enough on college – you don’t want to further lighten your wallet getting your son or daughter’s car to them at school. No matter how wealthy a person is, they deserve to find the best deal. At Easy Car Shipping you’re getting maximum value, because we give you dependable service, but also offer you the most competitive pricing. In other words, you’re getting reliable auto transport at the best price. 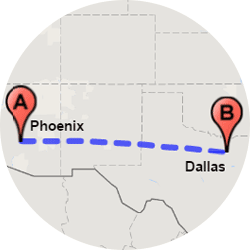 The quote for your car relocation is dependent on several factors, including when and where you’re shipping. The distance is one of the biggest aspects, as you can imagine. Is it going to a neighboring state, perhaps to your son at U of A or to a car buyer in Nevada? 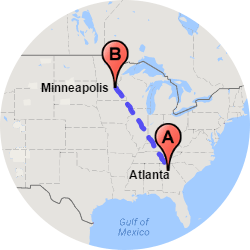 If it’s coast-to-coast transport you’re looking for, it takes longer, which is reflected in the quote. Most car transport companies will tell you that timing of your vehicle shipping has a bearing on the cost, as well. A car delivery to a more rural destination, one that doesn’t call for a lot of deliveries, may affect the total cost. The type of car transporter you need when you ship a car in Irvine has a bearing on the quote. While most people use the open transport option, which is a safe ride for cars, there are times when you may consider enclosed transport. The added attention you get with closed carriers makes it cost more. And whether or not your vehicle still runs is a factor too. We send over the appropriate auto transporter, a decision that depends on the size of your vehicle and whether or not it has special modifications. Did you order express auto transport? Standard delivery is less expensive than rush delivery. The good news is that with our Quick Quote system, we lock in the price for 14 days – guaranteed. 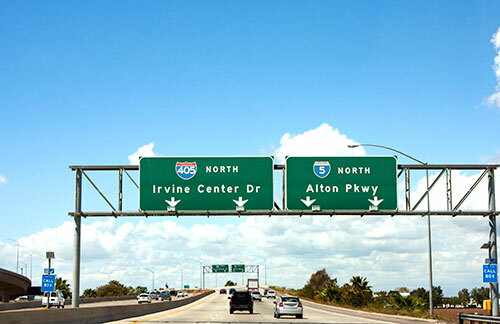 How long does auto transport take to or from Irvine? 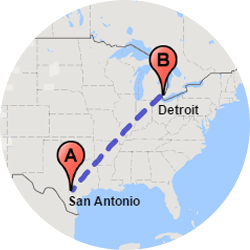 If you needed it “yesterday,” we’ve got good news: Auto shippers in Irvine offer express auto transport, with pick-up as fast as 24-72 hours. If it has to arrive for a special birthday, or another company dropped the ball, contact us. Most clients call us about a week in advance, but we’re happy to offer the rush service if you need it. 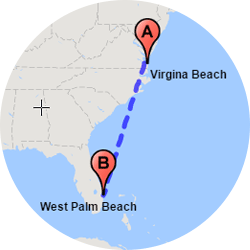 The greater the distance, the longer it takes. 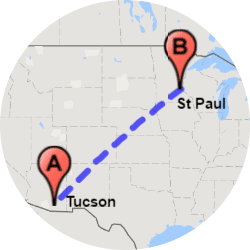 For car, truck or van transport in Irvine to places like Arizona or Oregon, drivers cover up to 200 miles a day. 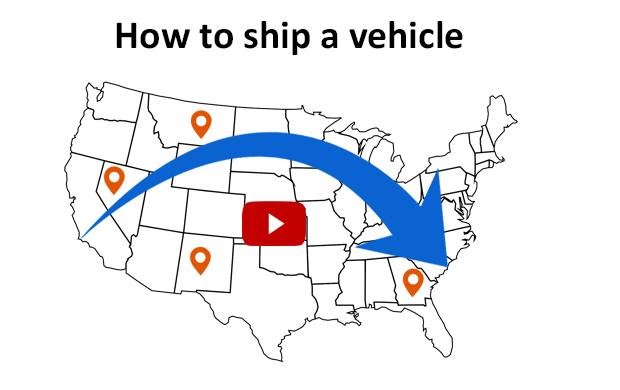 Are you shipping a vehicle coast-to-coast? 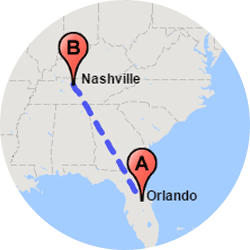 Our trucks drive up to 500 miles a day with nationwide shipping. Visit our FAQ page to get an idea the length of time required for your job. And whether it’s a classic car transport or motorcycle shipping in Irvine, the timing can be affected by the time of year. During certain seasons of the year, the delivery can experience delays due to inclement weather or seasonal traffic. Another potential holdup is when there are unforeseen circumstances, such as bad weather or construction. If your destination is off the beaten path or a rural community, it may take a little longer also. We stand out among auto transport companies in Irvine, because we stay in close communication with you throughout the process. We’re flexible, and with our experience, you know there are fewer bumps in the road – both literally and figuratively. 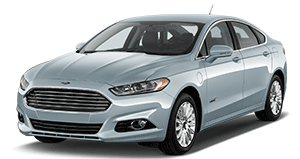 Why choose Easy Car Shipping for vehicle transport to or from Irvine? 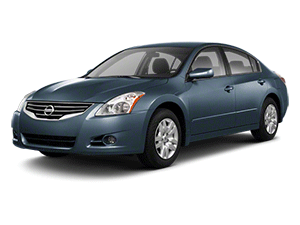 There may be a transport company for cars in Irvine that can give you a basic, temporary quote. We combine all the relevant details about your needs and offer you a quote that we guarantee for 14 days. We’ve been in the car business for more than 3 decades and we know the possible snags in the process. Also, the level of ongoing communication you get with us exceeds what you get from normal car transport companies in Irvine. The driver keeps you informed so you’re comfortable with the safe, reliable door-to-door delivery you’re getting. Our customers consistently keep us at an average rating of 4.6 out of 5 – higher than our competitors. It’s probably obvious, but car shippers are not all the same. When you look at us more closely, you’ll see we can be relied upon to exceed your expectations. You live in one of the most successful master planned communities in the nation. You also want a “master plan” when it comes to safely performing the transport of your vehicle. 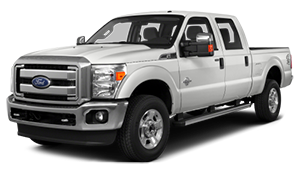 Picking up a Ford F-150 for a family move transport or completing a luxury car transport in Irvine, Easy Car Shipping has experience with it – safely and securely. Enclosed car transport in Irvine is advised for certain situations. If you’ve purchased from a dealer such as CarMax or on AutoTrader and your car is valued at $70,000 or more, we strongly advise you to choose an enclosed carrier. 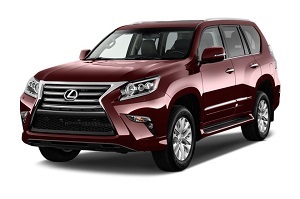 It protects your high-end vehicle from dirt, rain, snow and sun. 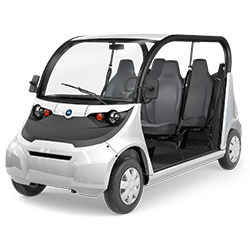 For motorcycle or golf cart transport in Irvine we also recommend having the 4 walls of a closed carrier surrounding your vehicle, because it’s a more secure method for lightweight cargo. Open carriers, which are chosen for most vehicle transport, can stack 8-11 cars on their trailer beds. An enclosed trailer usually houses just one, or possibly two, cars at a time. It’s considered the “first class” method of vehicle shipping in Irvine, providing your car the additional attention you desire. If you’re a firm like Clark Construction, and you’ve got an inoperable work truck or a oversized construction vehicle on a job site that you have to get back to corporate in Bethesda, you need a high caliber shipping company to do it. 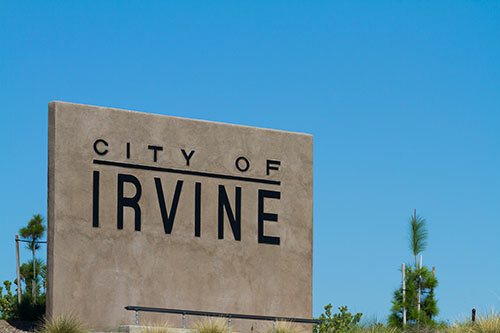 Or if you’re Irvine Charter Bus Company and you need to move a vehicle, you can contact us to help. 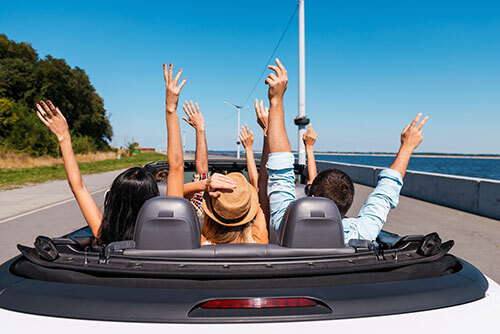 You’ll be pleased to know you have comprehensive insurance while your vehicle is in our hands. Your shipping quote includes insurance, and our promise to seek out the best timing for your delivery, plus the best price. The biggest insurance you can get is for us to assure you that your vehicle is our top priority. 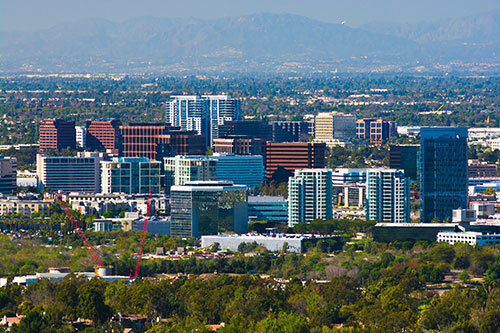 We work to provide the best shipping options in Irvine. If your driver has to navigate Los Angeles or Orange County freeways, not to mention interstate roads, you want to know your cargo and the carrier are safe. Auto transport in Irvine is our expertise. If you’re a car buyer, a dealer, a parent of a college student, or looking at a job transfer, we can help you.